Back in 1994, Ed Henderson, with his wife Nikki -- the principal organizer of the annual Tinner Hill Blues Festival -- had just gotten back into town from a fellowship to study in Africa and encountered something that would play a key role in creating an institution in The Little City. At the time, it was the first year of what was called the Tinner Hill Street Festival, which was started at the suggestion of Jim Edmonds, then the owner of Foxes Music Company. According to Henderson, the facilitator of the first street festival was Dave Eckert. Henderson said that the original festival was held on the land where developers are currently building the Lincoln at Tinner Hill on S. Maple Street. Local black church choirs performed and there were vendors, including Henderson, who sold wares that he brought back from Africa. The following year, the festival was held on Wallace Street, where it would take place for a number of years before moving to 106 and 108 Tinner Hill Road, the historic site where black Falls Church residents met in 1915 to fight a segregation law in the city. Eventually, the festival was moved Mary Ellen Henderson Middle School, then to Cherry Hill Park, where it’s held now and where it will be this Saturday, to allow more space for festival goers. 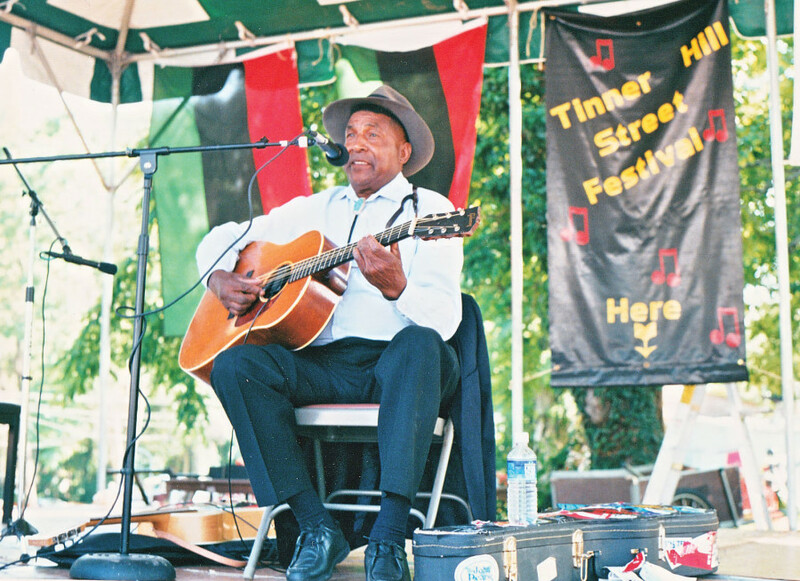 Since those first several years of the Tinner Hill Street Festival, which eventually became the Tinner Hill Blues Festival, the festival has grown from a local, homegrown event to a national and international affair. According to the Hendersons, festival attendance has grown from the hundreds in the first few years of its existence to the thousands in more recent years. And with that growth comes change, including change of venue. “One of the reasons we wanted to move to the Mary Ellen Henderson Middle School was that we wanted to grow the festival,” said Nikki Graves Henderson, the other principal organizer of the festival. The couple also runs the Tinner Hill Heritage Foundation, an organization with the mission of preserving the black history of Falls Church through various programs and initiatives. She continued that the middle school was new and, at the time, had no mature trees and was all blacktop. “It was hotter than Hades,” she said. So, at the suggestion of blues lover Lindy Hockenberry, who was then a City Council member, the festival was converted into a strictly blues festival and moved to Cherry Hill Park. Before then, the festival showcased all kinds of music – reggae, gospel, hip-hop – but Hockenberry thought that the festival could focus on blues in order to highlight the City’s blues history and love of the genre. The Hendersons, and the festival’s other organizers, which now includes a committee of eight to ten people to steer its vision, have had to overcome several challenges through the years to make sure the festival was not only self-sustaining, but able to help sustain the Tinner Hill Heritage Foundation’s other programs. Some of the major challenges over the years have been the bad weather, competing with other festivals for performers, finding funders and sponsorship for the event and getting people to pay for the festival in recent years who remember when the festival was free. One of the ways the organizers of the festival have overcome that last challenge was to constantly reinvent the event, which has grown from a one-day to a three-day affair. “We’ve constantly had to do assessments of what worked, what didn’t work and to create new ways of what we are doing every year,” Ed Henderson said. “In the beginning it was more of a family affair, a community event, and then with the preservation work it grew and grew. In recent years, planning for the event typically starts eight months in advance, the Hendersons said, and 60 to 85 volunteers work the festival, way up from “a dedicated few” who helped put on the festival its early years. The caliber and notoriety of the musicians booked to play the festival has also changed over the years. A recent favorite of Nikki Graves Henderson was in 2009 when Chuck Brown and Bobby Parker performed the blues. Nikki Graves Henderson said that there is still a “cross-pollination” of artists each year, with shows exhibiting Falls Church’s local blues musicians along with national artists. Because, despite its national and international appeal, this is a local event with economic benefit for the City.